The two-seater stunt plane Ira will use. Ira Losco checks the gear for Saturday. Pop sensation Ira Losco will be doing the loop-the-loop in an aerobatic plane at the AirX Malta International Airshow this weekend – after her fans dared her to. The local diva – who is afraid of heights – told Times of Malta she decided to put her life in her fans’ hands after her Facebook page reached 40,000 followers. “I’m very engaged with my fans and love keeping in touch with them through social media. I asked them what challenge they thought I should do. Some of the suggestions were pretty wild,” she said. Among the outrageous dares were white water rapids, sky diving and even straddling a flaming bendy bus. Ira, however, said she was won over by the flying challenge. “My whole family is in aviation so this seemed like a great challenge for me,” she said, adding that the experience would put her fear of heights to the test. 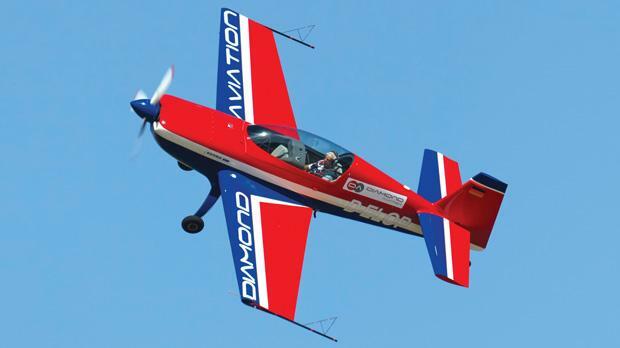 Ira will be strapped into the cockpit of a two-seater stunt plane and take to the skies ahead of the highly anticipated show by the Red Arrows on Saturday at 3 p.m. Her experience will be documented using three GoPro cameras hooked up to the plane’s cockpit. The video will then be uploaded on to her well-followed Facebook page after the air show. The star is celebrating the success of her new single, Me Luv U Long Time, whose online video has had more than 210,000 views. “I’m glad the song is doing well, I’ve got my fans to thank for that. I hope they enjoy watching me in that plane, it’s going to be wild,” she said.